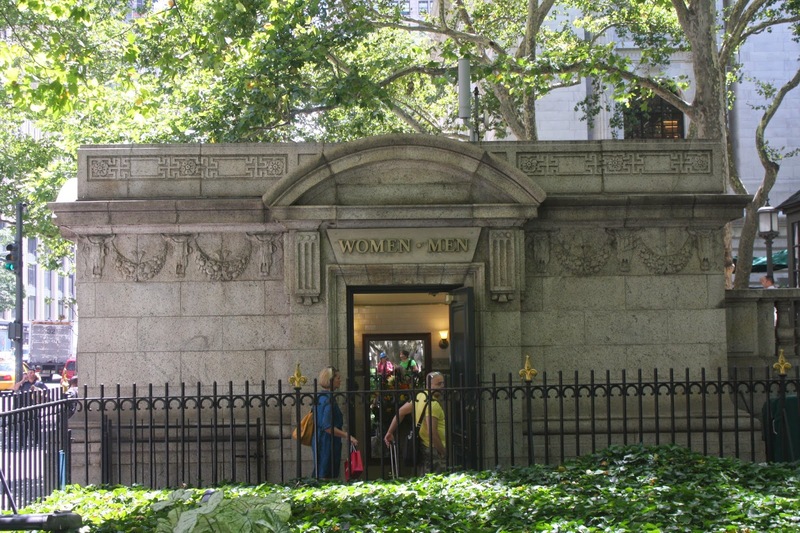 Bryant Park Blog: What's the Story Behind the Cattle Skulls in the Park? What's the Story Behind the Cattle Skulls in the Park? Bryant Park holds a wealth of captivating--and often surprising--small-scale details that you might not notice unless you know to look for them. One such detail, found on various surfaces in the park, is carvings of cattle skulls. What are cattle skulls, which usually bring to mind the American West, doing in our New York City park? The answer might surprise you! You can see cattle skulls and garland swags extending left and right from the "Women - Men" sign over the restroom doorway. The New York Public Library, built from 1902 to 1911, was constructed on the eastern side of the park in the then-popular Beaux-Arts style. The style adopted classical Greek and Roman design elements like columns, statues, urns, and reliefs. Built at the same time as the Library, the twin buildings currently in use as our Restroom and Park House (on the 42nd and 40th Street sides of the park, respectively) echo the Library's design elements and color scheme. The buildings' exteriors might look fairly ordinary--until you look up. Just under the roof line, you'll notice a relief featuring cattle skulls and swags of garland that wraps all the way around each building. This close-up photo of a cattle skull adorning the Park House shows the carving's craftsmanship. This technical term for the swags and skulls design is "bucrania" (singular, "bucranium"). In ancient Greece, carvings of cattle skulls draped with garland depicted ritual animal sacrifices made to the Greek gods. Like the Renaissance and Baroque architecture that came before it, the Beaux-Arts movement recycled the bucrania motif to signify respect for the ancient world. The Library, as a place of research and enlightenment, adopted bucrania as part of its visual vocabulary to indicate a knowledge of the past. In this way, the symbol of bucrania moved away from its original religious meaning and instead toward a new use as a signifier of learning, solemnity, and authority. We were so intrigued by the presence of bucrania that we started noticing the design in other places around the park. This urn, one of two that flank the base of the William Cullen Bryant statue, prominently features bucrania. 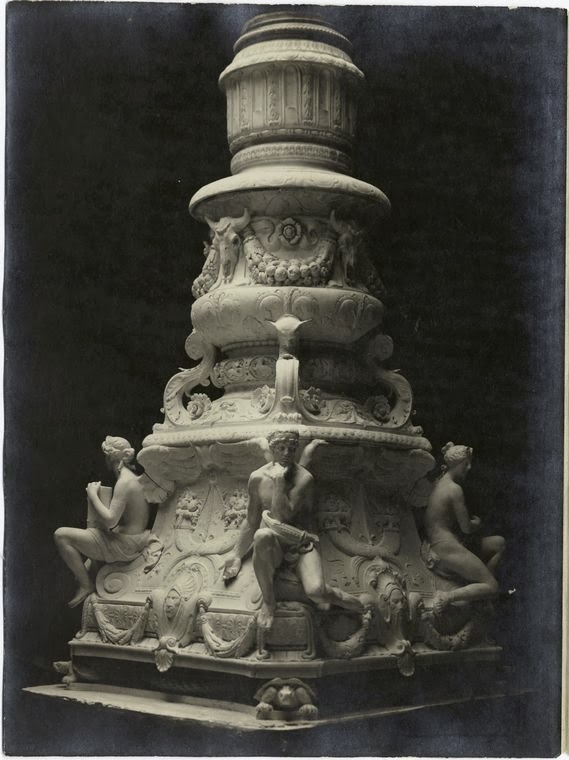 This photo of a flagpole base, snapped during the Library's construction, features typical Beaux-Arts characteristics like statues, swags and reliefs. You'll see that bucrania adorn the top section of the flagpole base, which is located on the Library Terrace. Where have you seen other instances of bucrania in the park? Tell us in the comments section, below. 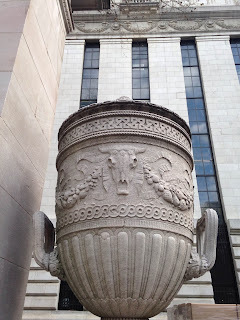 If you enjoyed this architectural tour, be sure to check out these posts from the BP blog about the history of the restrooms and animal imagery on the Library Terrace. For more information about the Library's construction, visit the NYPL website. This fun 1911 article from the New York Sun records the initial public reaction to the just-opened Library. For more reading on bucrania, check out this post from the Institute of Classical Art and Architecture's blog.